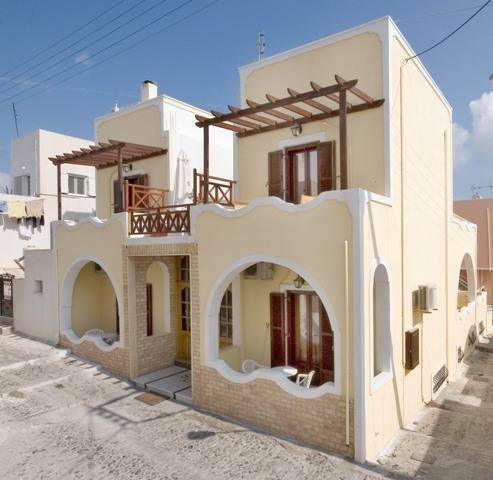 We have a very centrally located, clean and fully serviced hostel in just of the main street in Fira. Only 5 mins walk from the bus/taxi stand and 2 min walk from the pretty little town of Fira. 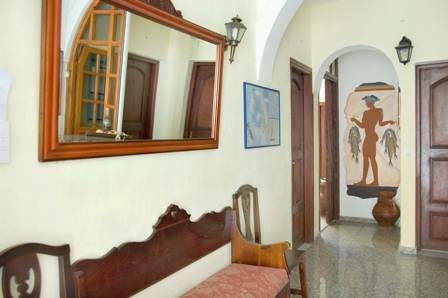 The hostel/villa has 18 private rooms, double, twin, triple and quad rooms available with private balcony/veranda. There is several lounges and sun terraces and we have a small swimming pool! San Giorgio Villa is located on a quite side street just on the central town square. We have several ourside areas/courtyards. At the reception desk we are happy to help with infromation about what to see on the island, to help rent a car or moped, to book boat tours around the island. There is a central parking area, central safe box, daily cleaning services and left luggage room. We will organise free transfers of required. Each room provides a private bathroom, balcony or veranda, fridge, air conditioning & heating, TV, safe box & hairdryer. Straddling the edge of the Caldera lies the town of Fira, the capitol of Santorini. Fira is very attractive, with winding narrow streets, stepped, white-washed houses, ancient marketplaces, picturesque churches, arcades and a quarter where the Catholic nobility once dwelt. There is a most important Museum, with prehistoric finds (mostly pottery), a large collection of vases dating from the 7th and 6th centuries BC (including the pieces known as 'Thera ware'), a few Archaic and Classical pieces, and some Hellenistic and Roman sculptures and portraits. There is a superb view out from Fira to the Kamenes, the two islets of black stone created by the volcano. Steeped in history, Santorini has plenty of archaeological sites to visit including the ruins of Ancient Thira, Akrotiri and the Venetian fortress at Pirgos. Santorini also offers unique accommodation, inspired by the distinct Santorinian-style, and on the south side of the island there are beautiful beaches with many beach sports and activities available. On the highest peak of Santorini is a monastery of the Prophet Elijah (Profitis Ilias), where there is a picturesque religious feast on 20 July each year. Best home cooked breakfast in town! Cancellation must be 48hrs before scheduled arrival, otherwise you will be liable for the first nights accomodation. Only 3 mins walk from the bus/taxi stand, off the central town square in Fira. We are happy to collect you from the airport or port, just let us know your travel details 24hr before arrival.